This course’s main purpose is to impart foundational knowledge in the principles and practice of cancer epidemiology, specifically in the areas of cancer aetiology, surveillance and survival analysis. The aetiology module will cover the design, analysis, and interpretation of observational studies. The surveillance module will contain an overview of the infrastructure needed to conduct cancer surveillance, aspects of data quality, and tools for using the data (standardization, age-period-cohort models). Finally, the survival analysis module will include material related to life tables, survival curves, survival time models and the application of survival analysis to screening trials and evaluation. Other topics that may be covered include: cancer etiology and surveillance in the local Indian setting, sample size calculation, and risk factor surveillance. An important aspect of this course will be hands-on exercises using examples to understand the theory and its applications in cancer epidemiology. To understand the designs used to conduct epidemiological research in cancer, with a focus on aetiology. To understand the challenges and opportunities in the collection and analysis of cancer surveillance data. To achieve an understanding of the variety of methods available for survival analysis, and when each is appropriate. 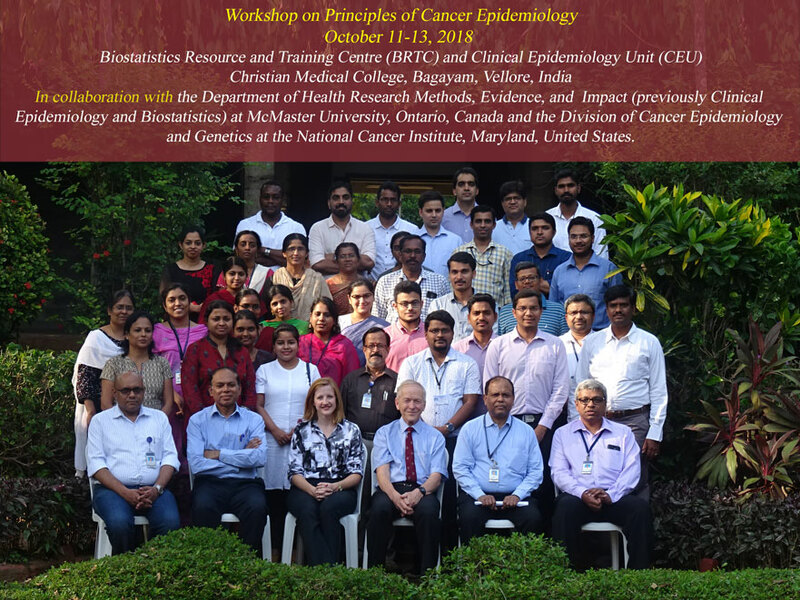 This course is tailored to medical, allied health professionals, nonmedical faculty, and/or researchers who are interested in learning more about cancer epidemiology, surveillance methods and survival analyses, or teaching institution members interested in furthering their knowledge and skills in methodology. Participants will have to bear their own expenses for travel, boarding and lodging. The Organizers will provide Lunch and Snacks. However, the organizers may arrange basic accommodation with A/C facility in the college campus on request. Only limited accommodation is available on campus and priority will be given to the female participants on first come and first served basis. The room will be available from 10th October evening onwards only. However, the list of hotels attached in the brochure. Course Fee should be paid in full by October 01, 2018. Note: After Registration if cancelled the course fee will not be refunded. In general, the workshop will cover designs in cancer epidemiology, data analyses and analyses of data from surveillance systems. Cancer screening concepts, data analyses (methods of standardization, Life table methods and surveillance) will be covered. The course will focus on data analyses, defining the denominators and different analytical methods. Other topics that may be covered include: basics of survival analyses (Kaplan Meier survival curves, comparison and Cox PH models).